Analysis Marketing: MPs Expenses - 1st Class Cost for 2nd Class Service? MPs Expenses - 1st Class Cost for 2nd Class Service? An awful lot has been written concerning MPs expenses with the focus being mainly on claims for items that didn’t exist or for excessive claims such as the Duck House. Now that the furore has to some extent settled down, we have the opportunity to look at less sensational examples where spending is merely higher than it arguably needs to be. In any business, the way some people treat costs is different where it isn’t their money as opposed to if it came out of their own pocket. A good example of this is MPs postage costs for pre-paid envelopes. 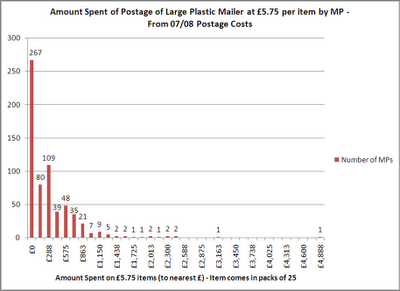 It doesn’t have the whiff of scandal of other areas but the cost of MP postage for 07-08 (the most recent published data purely for postage) was £1.66m so small changes could deliver significant benefits. Most analysis of MPs expenses has focused on overall spend, but the advantage of having detailed item expenditure as you have for postage is that you can get into the detail of how the total is created. For reference, C4 is an envelope big enough to send A4 unfolded and C5 is big enough to send A4 items folded in half. 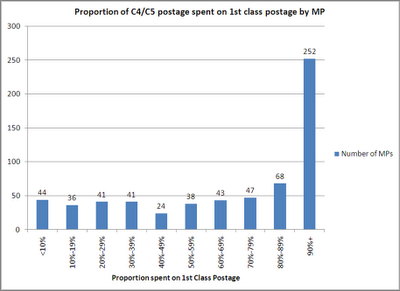 You can argue that constituents should receive prompt correspondence using 1st class post, but a sizeable proportion of MPs appear to balance their use of 1st and 2nd Class as appropriate. As well as the issue above, over £187k was spent on large plastic mailers which are charged at £5.75 per item (I'm presuming they are guaranteed next day delivery items). The distribution of these is even more skewed with over 42% of MPs not using these at all but with one MP (Betty Williams) spending nearly £5k on these items. It may be that Mrs Williams had a valid reason for using these envelopes but as she claimed for very little other postage (£1,100), it may be that her team were using these £5.75 envelopes as standard. This difference in attitudes as to making every penny count versus a more ‘extravagant’ approach is also likely to be visible in other areas of expense claims such as making sure bills are paid by direct debit to ensure a discount. They key point (as mentioned in previous blogs) is without the detailed data that creates the summary figures the real insights will be lost. Whether it’s expenses or campaign reporting, the real value is gained when digging into the detail. SAS Training - Blinkered Vision?